SSR, current, voltage, power, smoke, fire(? ), How to heat your bed! I saw lately a lot of nonsense in discussions about heated beds, the use of SSR's, current versus voltage. A large number of people seem to speak like experts about things that they do not seem to understand. As an electromechanics engineer (for what it is worth) here are my recommendations and some background on the electrical physics behind it. What does this mean in our real world? A 280W bed made for 24V will use 11,66 Amps (half of the current of the 12V bed since the voltage doubled) and a 280W bed for 120V will use only 2,33 Amps. You can also calculate the resistance of the bed if you want to check if it is still ok by measuring it. Alternating means that the voltage and the current go from negative to positive and back 50 times per second or in the US 60 times per second. The wave form is a sinus. 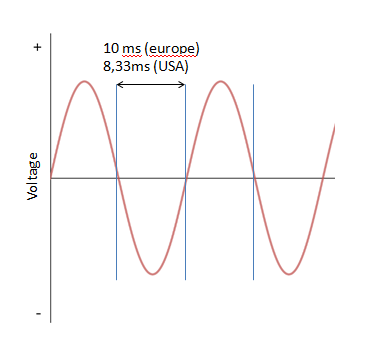 Electronics made for AC have no dedicated poles like + or -, but are sensitive to overvoltages. 120V AC electronics doesn't like to be connected to a 230V AC source. Direct current is the kind of current you get from a battery. One wire or pole is always positive while the other is negative. Hence the + and - marks. As you saw in the previous : high power means high current or high voltage or both. People tend to think that low voltage is safer then 'high' voltage. This is partly true. As long as you don't touch the copper 'high' voltage is ok. Everyone uses a power supply for their laptop with a wire on it carrying 230V (europe) or 120V (US) without even thinking about electrical shocks. One should indeed take some precautions to cover connectors. 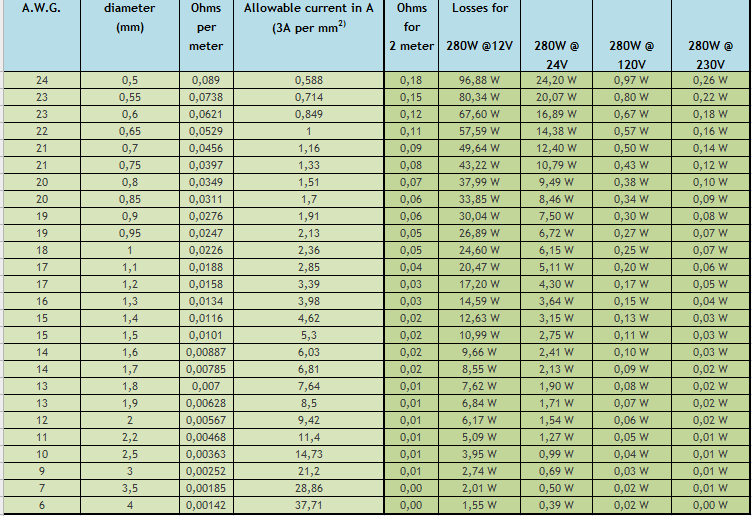 Low voltage on the other hand as shown before needs high currents for the same power. So let's get more into detail on the dangers inherent to high currents. Taking the 280W example this means a 23,33 Amps current flowing through a small resistance of 0,51 Ohms. This will deliver the 280W in the heater only when you measure 12V at the connectors on the bed. But ... one needs wires and connections (soldered, screwed ...) to get the current from the controller and Power supply to the bed. Every part will add some more resistance and as we saw earlier a resistance with a current flowing through it will start heating with a power directly related to the square of the current. But this is also occurring in the connections you make. If one doesn't fix a cable with enough force and thus creating a good contact, one will have a resistance at that spot and the same applies. But ... since it is a spot, it cannot dissipate heat easily and temperature can increase very fast and create a fire. (see example on this forum. Here is the table : Left side (lighter green) wire properties, right side losses for 2 meters of wire and different voltages. Message : The thicker the wires, the lesser the losses!! SSR stands for Solid State Relay. 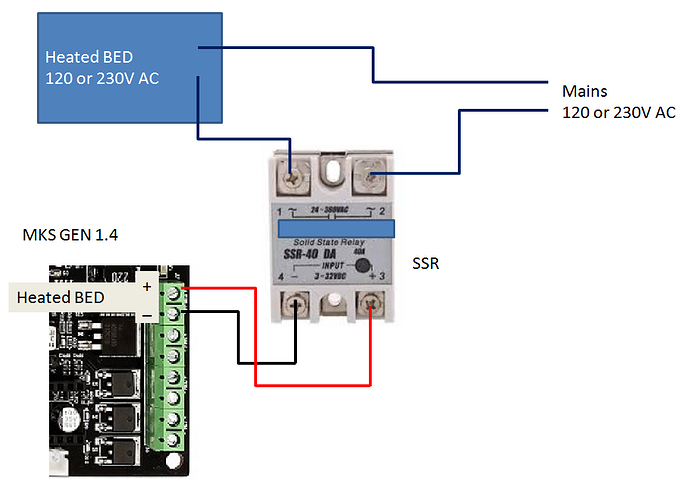 This is a device that uses a control signal that can vary in most cases between 3 and 32V DC and must be connected taking care of the correct polarity at the control side!! The output connects do DC only for a DC version and AC only for an AC version. What is the difference between those 2? The DC version uses internally a MOSFET to switch current on and off. The output follows the input signal immediately. Since they are used for the low voltage beds, they will switch high currents and because they are not ideal switches (without resistance) they will heat up with higher currents. You will need a DC SSR or a MOSFET switch like the TriGorilla. The TriGorilla stuff is in fact an open DC SSR with a heatsink mounted on it already. I recommend to choose a version that is designed for 150% or even higher currents. Choose at least 30 amps version for 20 amps through the bed. You don't want that this device starts a fire when you are enjoying a beer in the backyard while your printer is working on a long print in ABS with a fully charged heated bed. A DC SSR or a MOSFET device are connected in the same way. 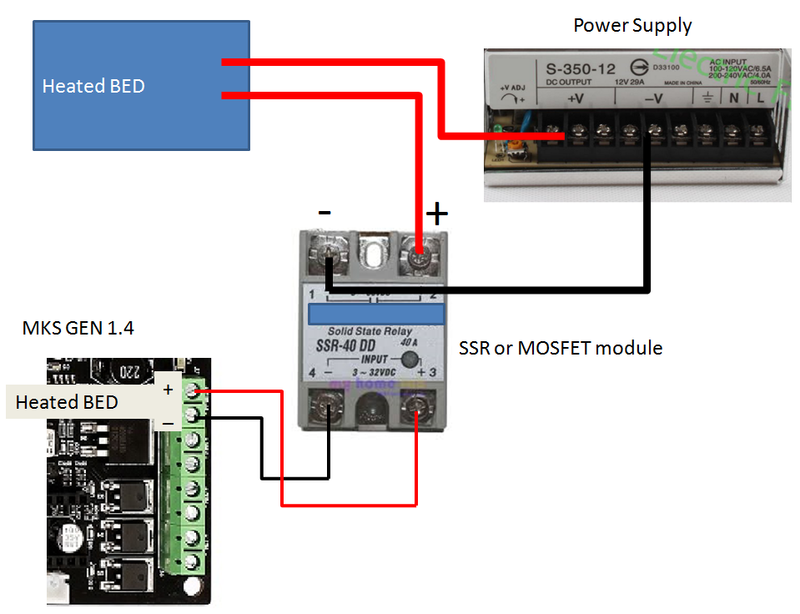 All the wires to and from BED-SSR-Power supply must be as thick as possible. Always try to get very flexible wire. In the pictures below I used some example SSR. Always check the + and - marks on the device you are using. The smaller connectors (bolts) should be the inputs, the larger ones outputs. Input and output should be clearly marked. I wrote 'should be' as the currents are different and that should be common sense. Always check the documentation that came with the device. You will need an AC SSR. Although having a lower current you should choose also a high current device. I have a 230V 750W heater using 3,26 Amps with a 30Amps SSR. The SSR doesn't even get handwarm. With the resistance remaining 0,51 ohms for the 280W bed, the current will increase to 25,2Amps (Amps = voltage divided by resistance) and the power will increase to 328 Watt.... but also the losses in the cabling and the risk of fire on connection components. The maximum power of the FT5 power supply is 360W so be cautious when playing with that. For those who spread the message you cannot PID an AC-SSR-ed bed : this is nonsense. Think before spreading this message. I've put some graphs in my modifications thread about that. I'm using that all the time and it is performing excellent! Unwanted heating may cause a fire!! Thank you for taking the time to write this out. I have pinned it to the top of the heated bed category. outstanding as usual @walter, I was surprised to learn and worth mentioning that you all on the other side of the Atlantic use a different letter than us in the states. here it is P.I.E.R not U.I.E.R but same equation any way you label it. I also took another look at you modifications thread and like the way you mount the heat pad as well. Like you I have mine mounted UNDER the aluminum bed and with glass on top. At first look you would think that I am still using the original aluminum PCB. I also see to many people that want to mount the glass right on top of the pad and it just doesn't look flat or stable and nothing to be gained. Last PID & AC-SSR are your friend, you don't need to use the max power of the 750W pad and you can set maxbang to limit it. Rather than have instant on heat I want it to take a couple minutes to warm up evenly with less thermal stress on the components - then warm up the hotend. It's a NTC 100k thermistor. Here is the R-T table for your reference. I have the original bed thermistor glued between heater and bed. This one is used as bed control since it has a good contact with the aluminum bed. I am making an Arduino based safety processor that will use the thermistor from the bed (build in) to detect overtemperature of the Keenovo, a separate thermistor will do the same for the extruder heatsink and a smoke detector will be in the top-level of the printer enclosure. If one of them detects an alarmcondition, a relay (real mechanical one) will cut power to all heaters. Project in development... Perhaps later another detection mechanism in the electronics box. That's a good solution too. PID and relay don't go together. Bang bang is the better solution. Relays have also low voltage drop. Still have to choose a relay with good contacts for high current though. Just one question : did you mount a diode anti parallel to the coil of the relay (anode to the plus, cathode to the minus of the heater contacts on the controller). Switching a coil can generate high voltage peaks that can destroy semiconductors like the MOSFET on the board . PID and relay don't go together. so DC SSR and pid = no but AC SSR and pid = yes? I see bang bang also mentioned but it looks like you are or were doing PID or did i miss something? AC SSR and pid = yes? you mentioned adding a circuit to protect dc controller connections so does your DC relay not have a triac in it? did i miss that too? I have a SSR with two antiparallel thyristors in it. I am busy developing a protection circuit in case of overheating. I don't know how insurance companies in the US treat cases, but that cannot be any better then over here in Europe. Never will give that I try. Better off with traditional methods. Although I use a mixture of HCL and H2O2 to get rid of the copper. That's not the traditional method neither. For the relay I went to the local automotive store and found a high current fog light relay, it has worked fineand they are cheap.But as I have told others I am never far from the printer when its running, and the room its in has lots of window so I can sit on the deck and have a beer and watch it run.smoke detector and eye's have not failed me and how I found the smoking SSR. For the diode - yes and no - I have back to back LED's on the coil leads. Something I did a while back because I have a number of hot bed options I brought the hotbed leads and thermistor leads out to a terminal block so I can change bed's without having to open the electronics box and I put the LED's on the terminal block so I can always see when the MKS wants the bed on, and I also have a volt meter on the power leads to the bed so I can see the voltage. As a last thought for anyone about to install one of the pads, keep the original thermistor as well as the one that comes with the pad. They way you actually have a spare built in that can be used for monitoring as well. And legal stuff : use the info at your own risk. know the limits of your skills and if you doubt about it : ask someone with the necessary skills to help you. The info above is provided with examples that may differ from what you actually have. ok, so I'm a bit of an electronics noob, I sort of understand what is being talked about but I'm still confused...Out of the box does this printer need a SSR or MOSFET or no? And if it does why doesn't it come with one? As soon as you work with high DC currents as it is the case with most 3d printers for heating the bed and especially when going to the limits with large heated beds (FT5), one should use a well cooled separate MOSFET unit to control this. The one used on most controllers has no heatsink and uses connectors that are at their limits for those currents. A separate MOSFET unit has better connections that are easier to use with the thick wires you need. Most of the controllers I know of are designed for currents to around 15 Amps which is equivalent to 12x15=180W at 12V or 360W at 24V heating power for a bed. One of the risks is that if you damage the MOSFET on the board when using it at or over its limits, you damage the board. If you know about electronics, you could solve that. Mitigating that risk by using a separate unit for the high currents is the better option in my opinion. if you got the newest (V3 i think, @csorrows can clarify i bet) ) heated bed with your kit, that might work but i highly recommend the silicone heating pad. my bed heats to 65c in under a minute and with the ssr, next to no load on the board. There are several great videos on youtube on the subject if you are curious. i believe i posted a pic or 2 but i have the duet wifi so am not using the mks board. Yes the new bed (black) is higher current. If I recall correctly, it now comes with a relay. I have the original kit. Each version has gotten better than the last. I trust the newest black one is usable with ABS.